Young professionals, do you need some advice on how to leave a lasting impression with your bosses on your entry level jobs? Learn five ways to do so in the following post. It can be discouraging for a job seeker to find an entry level job that requires work experience if he or she doesn’t have any. Isn’t getting the job supposed to help you gain some experience? Yes, but you can acquire it any other ways. Learn how in the following post. While many people are looking for jobs, others who have them may not exactly be content with what they are doing. This was the case for one former assistant who wanted more out of her first entry level job. Like most if not all college graduates, she expected to get a good job after graduation. Unfortunately, her new job didn’t live up to what she had hoped, but she persevered and moved forward in her career. This former assistant shares knowledge on how to succeed in your current job, satisfy your boss, and advance your career in a recent article. However, if you’re a college graduate looking for a job in this economy, it’s important to get your foot in the door, and be productive in your search. 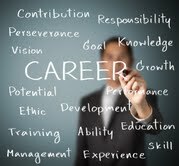 Remember, your first real job is a stepping stone on your way to a successful career. Information provided by Lilit Marcus and Nancy Cook. Great article today at CNN.com about the first jobs, ahem, enjoyed by some of the most famous chief executive officers in the country. For example, did you know that Steve Jobs, CEO of Apple, can trace his work history back to an internship he completed at Hewlett-Packard? That might strike many as not terribly surprising, but consider this: he was 12 years old. You’ve likely heard of the “promote from within” promotion policy used by leading organizations such as Enterprise Holdings, the parent company of car rental businesses such as Enterprise Rent-a-Car. That policy works extremely well for some organizations as every employee knows that they have a legitimate opportunity to advance as far and as fast as their performance dictates. Well, how about starting on the night shift, dressed in blue polyester, earning $2.65 per hour, frying burgers at McDonald’s? Where do you think that person ended up? Well, that person is Jan Fields and she’s now the president of McDonald’s USA. Good advice. Students…are you listening?